During W.W.II the Germans were faced with an ever increasing armor threat, especially on the Russian Front against the T-34 tank. 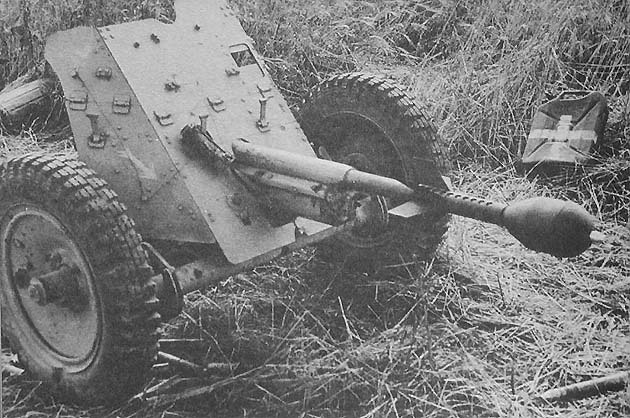 The German 3.7cm PAK (Panzerabwehrkanone) 36 anti-tank gun was in wide spread use but pretty much ineffectual against tanks in general by 1941.While newer and more effective anti-tank guns were in production, distribution was another matter. Nor could they afford to just abandon the many PAK 36's in the field. Besides, it was still an effective light field gun. It is far easier to upgrade ammunition than the field piece and so was born the last (?) 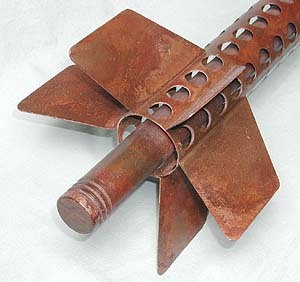 "rod grenade"...the 3.7cm Stielgranate 41 (a.k.a. 3.7cm Aufsteck Geschoss - "Attached Projectile"). This is a finned bomb with a massive hollow charge warhead. It weighed almost 8.6kg(19lb) and had a very slow muzzle velocity of 110mps (361fps) which gave it an effective a range of only 300m(328yd). It could reach out to about 800meters and would be just as deadly (as hollow charge weapons do not depend on velocity to do their work), but lack of accuracy is what limited it to a close range weapon. However it packed a big punch. The 2.42kg (5.3lb) warhead could penetrate 180mm (7in) of armor plate. Quite formidable for its day and could defeat any tank of the time. The projectile was loaded in the muzzle of the gun, like a rod grenade and was fired with a special propellant cartridge. There are gas-check grooves in the base of the rod to reduce gas blow-by. (I wonder it the cannon suffered he same negative side effects as rifles used for launching rod grenades during World War I ? If so this would be a "last ditch" weapon of choice. Interesting that it used both point detonating and base detonating fuzes. A rather unique fuze combination for a hollow charge munition. 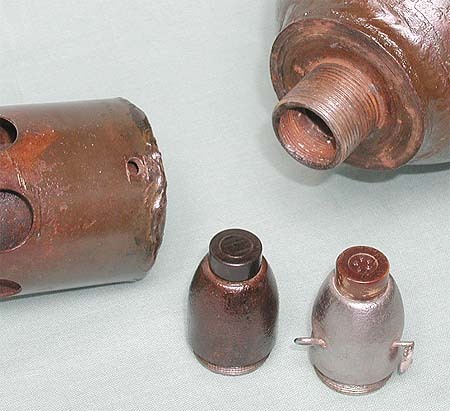 Direct Action fuze derived from the AZ5071 rifle grenade fuze and also used with the 88mm Raketenpanzerbüchse (Panzerschreck) AT weapon. The fuze on the left is the one that came with the round, but it probably is not the 5075 - can't tell as the numbers are not readable. Improved version of the AZ 5075 having an arming device locked by a safety pin to prevent movement due to rough handling. Here is the PAK 36 with the Stielgranate 41 attached. Note the 37mm round in the grass at the lower right. It may be a standard H.E. round or possibly the special blank launching cartridge?